I’m sure that many of you reading this will have heard of Makoto Shinkai before. Whether it be because of his smash hit Your Name or one of his other films, it’s difficult not to know this director’s name. However, my first introduction to Shinkai was back in 2013 when Crunchyroll took part in “Global Shinkai Day” and streamed four of his films: Place Promised in Our Early Days, Voices of a Distant Star, Children Who Chase Lost Voices and 5 Centimeters per Second. Of the four, I decided to watch 5 Centimeters first and fell in love with Shinkai’s beautiful animation and knack for storytelling. Five years later this wonderful film is coming to the UK on Blu-ray thanks to Manga Entertainment, and so I’ve decided to revisit it and see if the love that bloomed back then still remains. 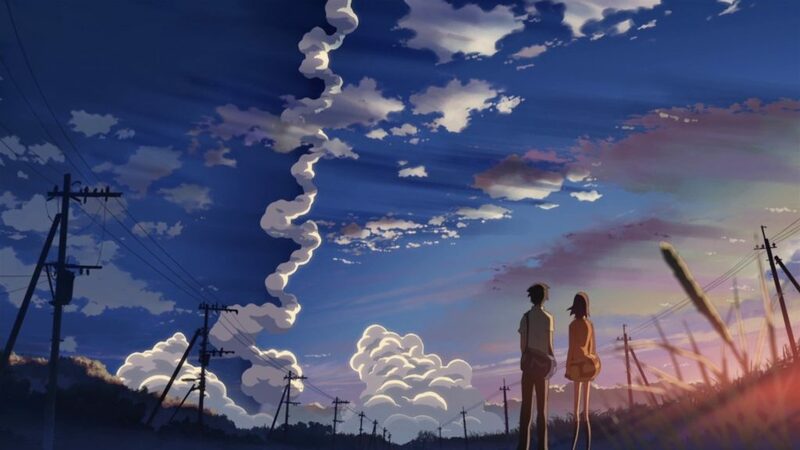 5 Centimeters per Second is a film made up of three short episodic stories following the life of Takaki Tono and his romantic interests. The first episode follows Takaki and Akari Shinohara, who has just transferred into Takaki’s elementary school. The two are inseparable until the day that Akari’s family moves away from Tokyo. Takaki and Akari keep in touch by exchanging letters (this story is set before the internet and smartphones were widespread) but eventually Takaki’s family decides to move as well, which will only serve to further the distance between them. With the move fast approaching, Takaki makes plans to visit Akari while he still can – but when a severe snowstorm hits during his travels Takaki worries that he’ll never reach her and tell her that he loves her. The final story revolves around Takaki as an adult and shows us how his life has changed since we last saw him. Given that this wraps up the whole story I won’t go into details, but it should be said that this is the weakest arc of the movie. 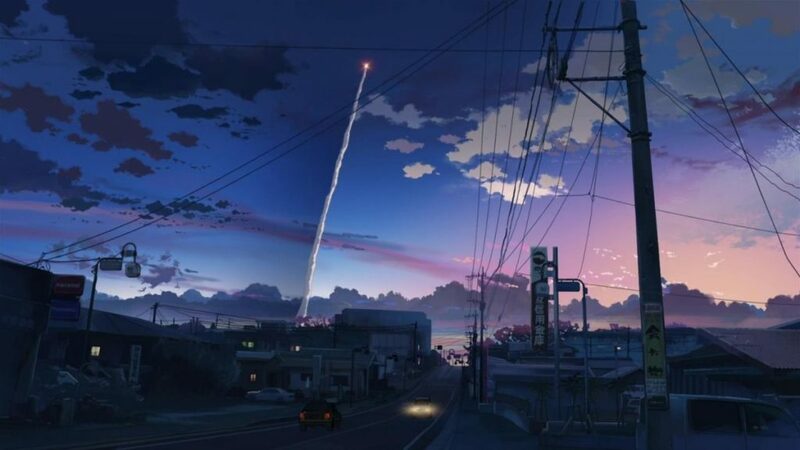 5 Centimeters per Second unfortunately comes from a time when Shinkai just couldn’t devise a satisfactory ending for any of his movies. Although I feel like the film deserves some slack for only being Shinkai’s second full-length movie, it’s still hard not to admit that the ending ruins much of the emotion that he spent so long building up throughout the story. It’s underwhelming, somewhat open-ended and, most importantly, disappointing. 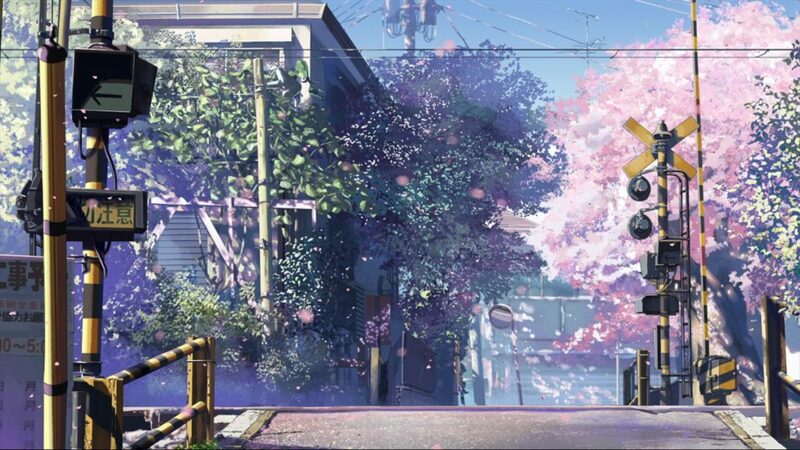 Having said that, I’d never say that 5 Centimeters per Second has nothing going for it. Overall this movie is about distance and unrequited love, both of which that Shinkai manages to convey very well in his animation and direction. Although Takaki isn’t a particularly likable character (he’s kind of irritating if I’m honest), he gives off an aloofness in the second act that perfectly conveys to the viewer that he wishes he was somewhere else. Although the distance between Takaki and Akari isn’t that much in the first act, here too Shinkai manages to expertly convey the sense of loss and loneliness associated with travelling long distances alone. Despite it only taking several hours to make, Takaki’s journey feels like it takes a lifetime. Now feels like a good time to mention that if you truly want to get the most out of 5 Centimeters per Second it’s worth also checking out the manga adaptation, which Vertical published in English. It’s a fairly straight adaption of the movie for the first arc but the second and third sections are much more fleshed out. It also works as a fantastic companion piece for those wanting to get more out of this story, especially as it’s been released as a single omnibus edition. While the manga doesn’t fix my problems with the ending, I’m actually incredibly fond of it,regardless. It’s also worth noting that Vertical plans on publishing the light novel adaption of the story in English early next year. Animation for 5 Centimeters per Second has been handled by CoMix Wave, like all of Shinkai’s works, and although this film is beginning to show its age (first released in 2007!) the animation still looks incredible and is very easily recognisable as being Shinkai’s work. The settings are bright and colourful with a real sense of life to them and everything has a lot of detail put into it – even small things like the train tracks you only see for a single cut. He also expertly conveys the darker sections of the story with more muted colours, which creates a gloomy and cold atmosphere. It’s almost worth watching the movie just for the animation alone. Having said that, this film also comes from an era where Shinkai’s character designs were dreadful and looked like they came straight out of the 80s, which is perhaps the kindest criticism I can give them. Frankly, they’re terrible but can be overlooked when everything else shines. Where music is concerned, the soundtrack has been handled by Tenmon (The Place Promised in Our Early Days, Children Who Chase Lost Voices from Deep Below) and offers a range of tracks mostly limited to piano and violin arrangements. The soundtrack is a delightful listen, and even though I’ve watched this film countless times it never grates on me. Not being overbearing is important for a story like this, and I think keeping the compositions simple is what 5 Centimeters per Second needed. This release includes both the Japanese and English dub audio. While neither collection of voice actors really won me over, the English dub is probably going to be the better listen for most viewers. Played by Johnny Yong Bosch (Aiden Field in Violet Evergarden, Makoto Tachibana in Free! ), Takaki has a lot more emotion within his voice in English than the way Kenji Mizuhasahi plays him in Japanese, and that lends itself better to the viewing experience. I think Takaki is a difficult character to convey because, even just going by the script and on-screen actions, he can be incredibly lifeless at times, so Mizuhasahi’s depiction isn’t necessarily wrong – but I do think it’s easier to get invested with the dub. 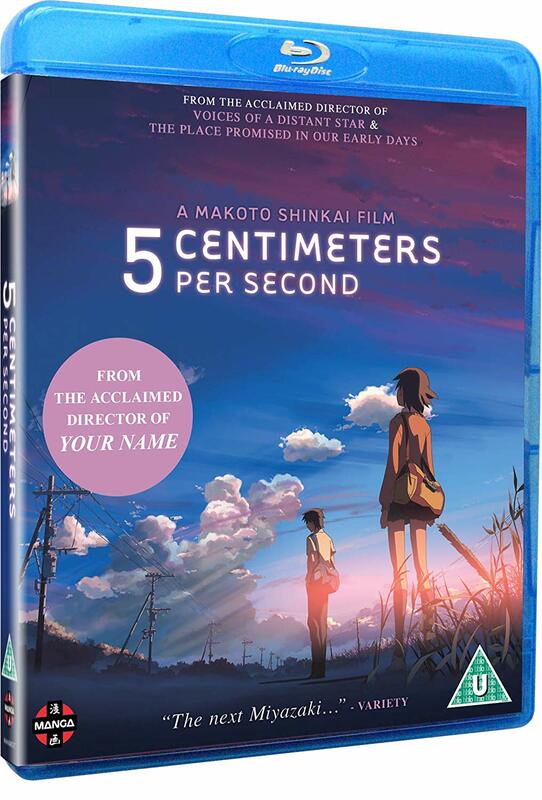 Although 5 Centimeters per Second has been out on DVD for quite some time in the UK, this release from Manga Entertainment is the first time it’s hit our shelves as a Blu-ray. Including a host of on-disc extras including cast interviews, trailers and a special music video for the ending theme, “One More Time, One More Chance” (performed by Masayoshi Yamazaki), there is certainly a lot of value here for your money. The animation looks stunning on Blu-ray too, so this edition is certainly a must-own for both new and old fans of the film. 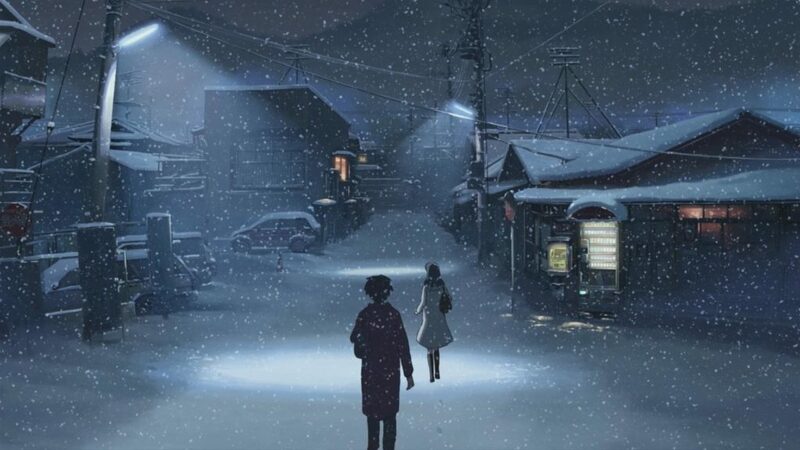 Overall, 5 Centimeters per Second certainly has its issues, and the story hasn’t necessarily aged that well compared to Shinkai’s later works, but existing fans of the film will no doubt get a lot of joy from watching the film on Blu-ray (where the animation looks fantastic). Unless you’re really invested in Shinkai’s films however, newcomers to his work may want to give it a miss in favour of his better stories.